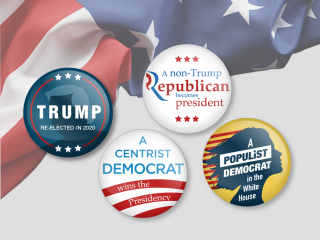 At the risk of altering the atmosphere as we move into this beautiful part of the year, we try to make a brief recapitulation of 2018’s “rights and wrongs” together with an evaluation of our initial forecasts from the start of the year. It’s brief, we promise! The economy grew an impressive 6.9% in 2017 on the back of spurring private demand fuelled by double-digit wage hikes. While everyone agreed that the same pace could not be sustained in 2018 as well, the growth forecasts were projected within quite a wide band: from just above 4% to around 6%. We started the year with a 4.7% GDP growth forecast, one of the lowest in the market and versus the official projection of 6.1%. 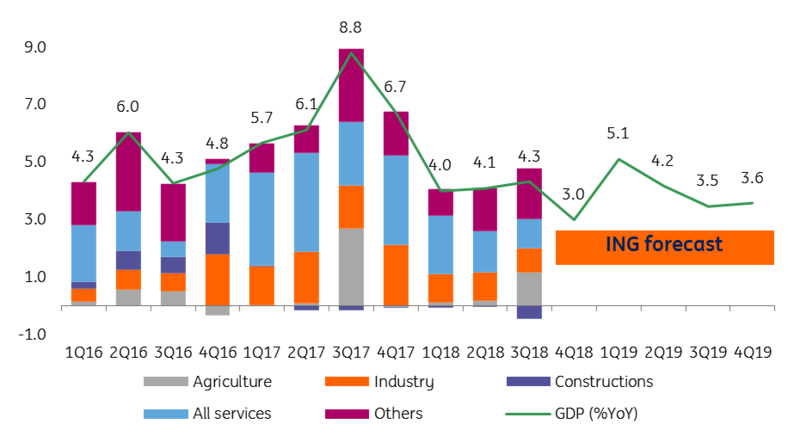 The material slowdown was visible starting in the first quarter of 2018, which posted 4.0% growth. The next two quarters confirmed the new cruising speed, coming out at 4.1% and 4.3%. As the data is out for the first three quarters, we now forecast a 4.2% growth for 2018. The massive wage increase from 2017 led to a build-up in inflationary pressures which overlapped some important base effects and the rise in oil prices. Inflation has been stubbornly high for most of the year, reaching a maximum of 5.4% in June and forcing the central bank into an aggressive frontloaded tightening. This started in late 2017 and continued with three rate hikes in the first part of 2018, bringing the key rate to 2.50%. At the beginning of 2018, we had penciled the key rate to end this year at 2.75%, which was at the bottom of consensus back then. The sharp drop in oil prices has greatly helped the National Bank of Romania (NBR) and brought inflation within the NBR’s target band of 2.5±1ppt towards the end of 2018. 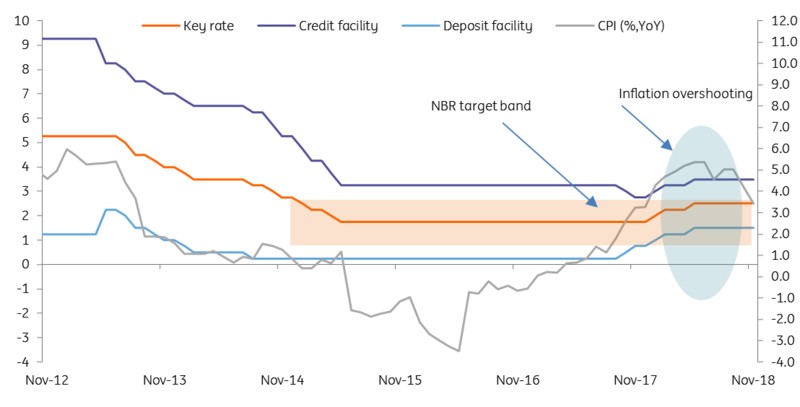 Hence, the hiking cycle has been put on pause for a while, though broad monetary conditions have been generally tighter than those reflected by the key rate. As for headline inflation, in January 2018 we forecasted the year-end at 3.1% and now, with the December print still to be released, we see it at 3.2%. Exchange rate: is the patient dead or alive? 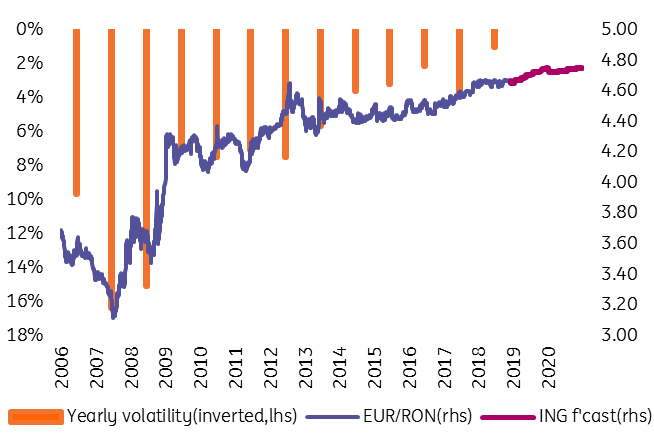 The EUR/RON exchange rate has been under a tight managed floating regime, with NBR fixing moving within a narrow 1.1ppt in 2018, likely aimed at containing inflation expectations. This was done via some FX interventions but mostly with liquidity controls as cash rates often spiked towards or even above the Lombard rate (at 3.50% currently). Our 4.67 forecast for the end of 2018 looks quite close to the current market levels. So, what went good in 2018? Last but not least, in 2018 Romania marked the 100 year anniversary of the Great Reunification of all its historical provinces. "The Centenary Anniversary Year" has been a reason of celebration for many Romanians and, why not, for generous public spending on festive occasions throughout the country. Happy anniversary!